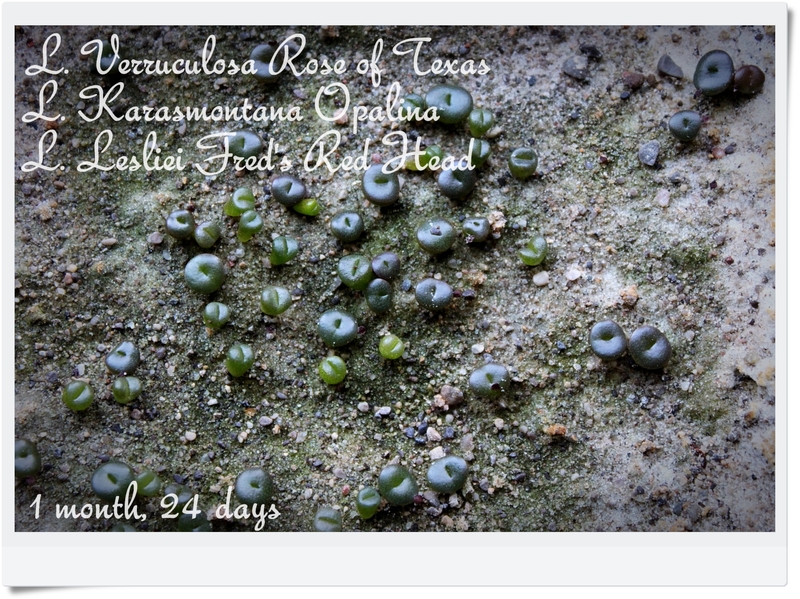 It’s takes a lot of patience to grow Lithops. 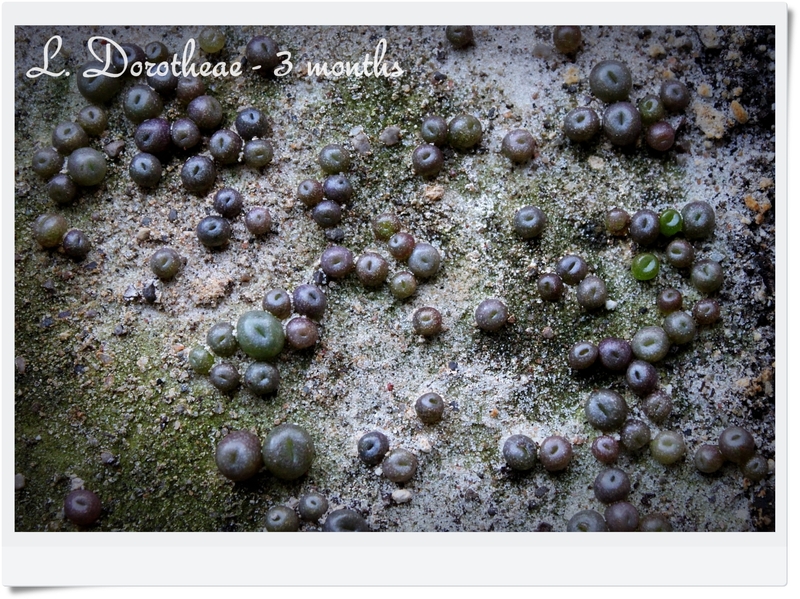 It take more to grow Conophytum. 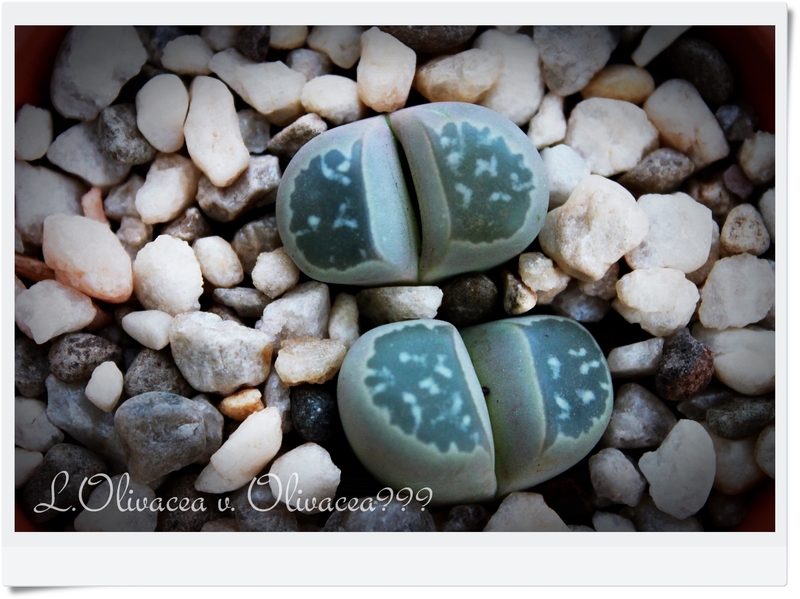 In the photo on the left, the Lithops is thirsty and is asking for water. How do I know? Look carefully at the red arrows and you will notice distinct wrinkling on the shoulder of the plant. This is the plant’s way of telling you, “I’m thirsty”! 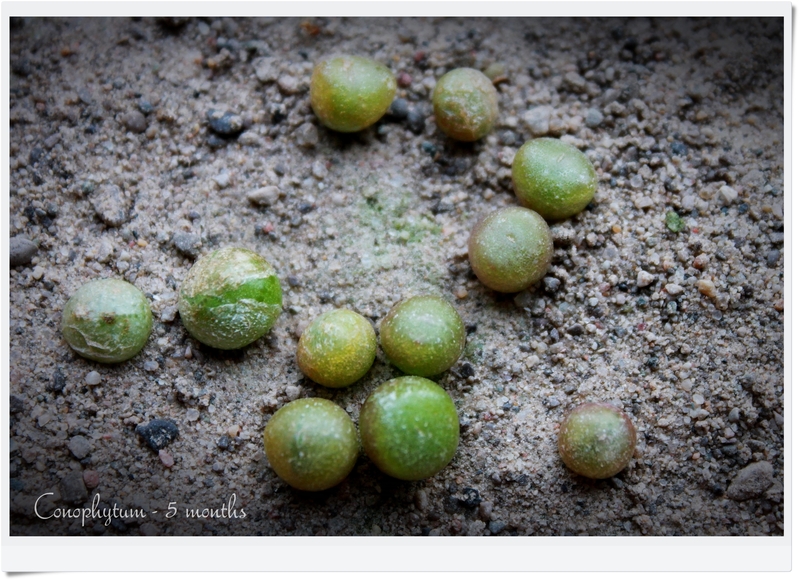 In the photo to the right, you see the same Lithops, two days later, after a good drink. Notice how the shoulders are now smooth and the plant looks plump? We call this a “turgid” plant. This plant is once again completely hydrated and happy! Don’t water again until you notice the distinct wrinkles appear on the shoulders. In the case of this particular plant, it took a day or so after watering for it plump up again. When I water, I like to give my Lithops a good drink. They are all planted in well draining soil, so I have no hesitation in giving them a good soaking at watering time. Another month has gone by and the 2014 seedlings continue to flourish. I continue to water them twice a day with a good soaking on the weekend. They live under lights, indoors, with approximately 12 hours of light a day. I do my best to mimic what is happening outside. I’m excited to see what these guys will look like as they go through their first leaf renewal, but experience tells me that I have at least a month, and maybe more, to wait before that happens. 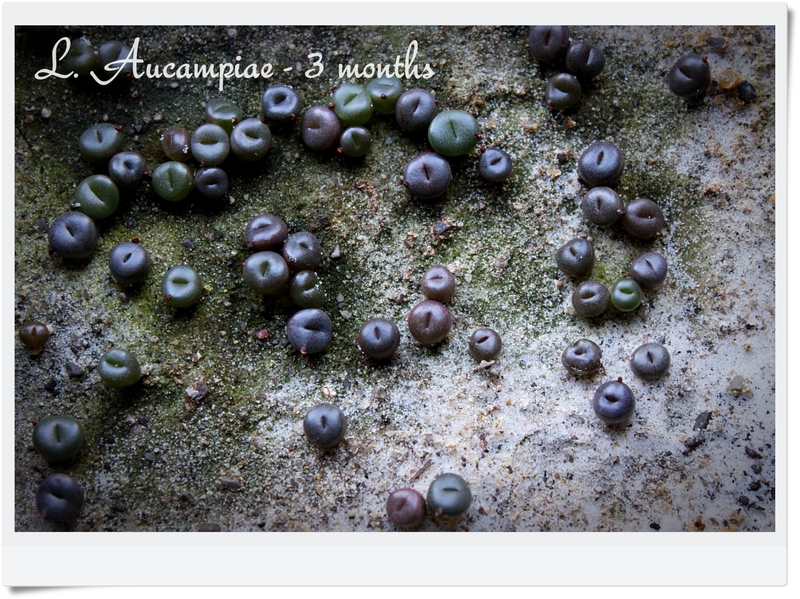 The Aucampiae seedlings are getting so BIG! In this pot, I have a mix including Storm’s Snowcap and Kurumen form. The seeds were purchased from three different sources so I should have a nice variety here. I love the deep purple tones of some of the seedlings. The Dorotheae pot continues to grow at a slow pace. I can see some brand new seedlings so I think some slow pokes are still germinating. There are also a few really large seedlings which makes me really wonder what I’m going to get out of this pot! I sowed seeds for Zorro in this pot so I hope for some really stunning plants. 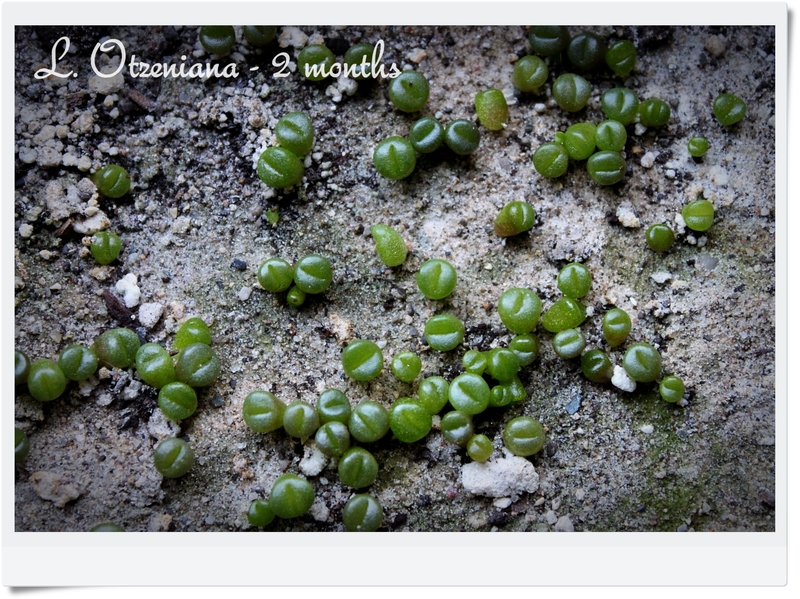 If you followed the blog while the 2013 seedlings were developing, you’ll know that I didn’t have much luck with Otzeniana last year. I have quite a few robust specimens this year so I’m hoping my luck has turned around! Most of the Otzeniana seeds came from Hong Kong, so I looked far and wide for these guys.